Some say that manufacturing in the U.S. is a declining industry and therefore not a promising market for cloud ERP. For example, in a recent Workday analyst event, CEO Aneel Bhusri said that 80% of the world’s businesses today are services-related and that what is left of manufacturing is mostly based in China. There is no clear leader in manufacturing cloud solutions, he said. But the lack of scale among manufacturing cloud ERP providers cannot be because the market is small compared to other industries. Yes, manufacturing’s share of the U.S. GDP has declined slightly over the past decade from 12.3% in 2008 to 11.7% in 2016. Nevertheless, manufacturing is still a major part of the U.S. economy. As noted above, in 2014 there were over 63,000 U.S. manufacturing companies with 20 or more employees. (In our analysis, we omit companies with fewer than 20 employees because, in our opinion, they distort the ERP market opportunity.) 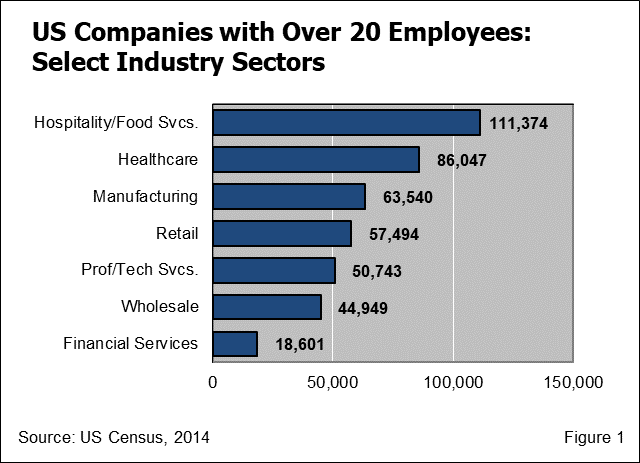 Only hospitality/food services and healthcare are larger in terms of number of companies. Interestingly, the professional services sector—a favorite target market for Workday, NetSuite, and other cloud providers—falls well behind at about 50,000. If the size of the domestic manufacturing sector is large, then why hasn’t there been a cloud ERP provider for manufacturing with the scale of Salesforce or Workday? The answer is that developing applications for the breadth and depth of manufacturing industry requirements is a bigger and more difficult job than developing horizontal applications such as CRM or HCM that cross a variety of industries. Manufacturing is not a single sector but a variety of subsectors. The U.S. Bureau of Economic Analysis tracks 19 manufacturing subsectors for durable and nondurable goods, such as motor vehicles, furniture, food and beverage, chemicals, and electronic products, to name just five of them. By contrast, the retail sector, financial services, and healthcare each have four subsectors. The professional and technical services sector—a cloud ERP favorite—has just three. ERP systems serving the manufacturing industry must not only fulfill requirements based on the products being made, they must also satisfy the unique needs of various modes of manufacturing First, there is process manufacturing (e.g. liquids, gases, powders) and discrete manufacturing (i.e. discrete units of production).. Within process manufacturing, there is batch processing and continuous flow. Some manufacturers make to stock. Others, make to order or assemble to order. Some, configure to order. Others, engineer to order. Many utilize a combination of these methods. The planning and execution systems for these various modes and methods of manufacturing have distinct differences. A specific example shows how manufacturing requirements vary considerably by subsector. In IT strategy consulting work, we recently developed an IT roadmap and facilitated an ERP selection for a wine producer. One might think that if an ERP provider has brewery customers it should be able to serve wineries. Although there are some similarities, especially in the distribution requirements, when it comes to production management winemakers are quite different from beer makers. An ERP salesperson who tells a winemaker that its brewery system will work in the winery would be laughed out of the room. The fact that much manufacturing these days takes place in China does not really change the equation. Rather than making life simpler for U.S. manufacturing firms, offshore outsourcing increases the complexity. It actually adds to the requirements that manufacturing systems must satisfy, specifically around demand management, order promising, supply chain planning, and logistics. Moreover, this is not just a challenge for large manufacturers. It is surprising to what extent even small manufacturers now must manage global supply chains. None of this is to underappreciate the complexity of HCM or CRM systems. We are only pointing out that there is a much greater variety of requirements to be satisfied by operational systems in any industry, and especially for manufacturers. This is why HCM and CRM are called horizontal applications: They serve customers across multiple industries. Operational systems are vertical applications: They serve a narrow slice of industries or subsectors. The leading providers of traditional manufacturing ERP took decades to build out their systems to meet the needs of various manufacturing subsectors. In addition, there are dozens if not hundreds of traditional providers of manufacturing operational systems, such as blend management in wineries, as mentioned in our previous example. Although modern cloud platforms make application developers more productive, it will still take many years for cloud manufacturing systems to reach the breadth of functionality of traditional manufacturing ERP systems in all subsectors. Plex Systems, perhaps the most-mature manufacturing cloud ERP system, is a good example of what is involved. It has an embedded manufacturing execution system (MES)—rare even for traditional ERP systems—and it recently added embedded supply chain planning. But for all its breadth of functionality, it only targets automotive suppliers, food and beverage manufacturers, industrial product makers, and a few aerospace and defense suppliers. Ask Plex salespeople to bid on a manufacturing deal outside of these few subsectors and, most likely, they will politely refuse. NetSuite, until recently, was most comfortable selling to companies with “light manufacturing” operations, such as wholesale distributors that had some assembly operations. It has also done well where manufacturers have a direct selling model, with NetSuite’s embedded web commerce capabilities. Now, through a combination of acquisitions and new development, it has started to move into more complex environments. But it will take some time for NetSuite to mature its advanced manufacturing capabilities. Other cloud ERP providers—SAP’s Business ByDesign, FinancialForce, Kenandy, Acumatica, and others—likewise focus on specific manufacturing subsectors. It is likely that in the future, there will not be a single cloud manufacturing ERP provider serving all subsectors. It is more probable that we will see a combination of providers, each serving specific manufacturing subsectors. Cloud solutions for manufacturing ERP are in a period of maturation. There is a lot of white space in this market, into which existing cloud ERP providers can expand, or new entrants can stake a claim. Moreover, it would be a mistake to rule out the cloud offerings of the traditional vendors. SAP, Oracle, Microsoft, Infor, and others are investing heavily in cloud versions of their traditional offerings, or in some cases, developing new, cloud-only offerings. When cloud is merely a deployment option for their traditional offerings, their cloud characteristics may not be as “pure” as those of the cloud-only providers. But in some cases, their industry functionality is better, depending on the subsector. Evaluating options, therefore, means understanding each provider’s road map. For the cloud-only providers, are they building out the needed functionality for the buyer’s subsector, as well as for its modes and methods of manufacturing? For the traditional vendors, to what extent are their offerings true cloud systems, for example, in taking responsibility for version upgrades? In any event, although it will take time for cloud ERP to mature for the breadth of the manufacturing industry, it is a huge opportunity. The options and choices will only improve. Update, June 6: Clarified NetSuite’s customer count and revenue number. This entry was posted in ERP Selection and tagged Acumatica, Cloud, ERP, ERP Selection, FinancialForce, HCM, Kenandy, NetSuite, Plex, SaaS, Salesforce.com, SAP, Workday. Bookmark the permalink.